Todd Bergen and Blazed By Commander marked a 220.0 in the 1st go round, earning a spot in the 2nd go round. They missed making it back to the finals (only 30 of 452 horses made it into the Open L4 finals this year). Good luck in the Derbies next year! Congratulations to Katie Neubert and CD Shines. The pair secured the Intermediate Open Champion title with a 220 score on Sunday. Congratulations to Jake Telford and Hes Shinettes CD. They are the Open Derby Reserve Champions! Congratulations to Sheza Dancing Diamond (2007 mare out of Sheza Shinette) and owners Susan and Dell Bell on their Open Derby Championship as well as Nic The Wrangler and owner Bruce Pinkerton on their top three finish in the Open Derby. Jake Telford and Nabisco Roan seized another Open Two Rein Championship. Wranglin Reminicky finished in the Top Ten of the Open Two Rein division. Stacey Hanson and Sheza Roo claimed the Limited Open Bridle Championship. Congratulations to Todd Bergen and Smart Luck. 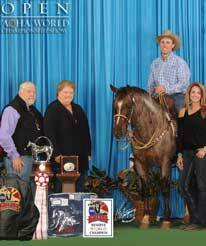 They won the Holy Cow Performance Horses Open Bridle Spectacular with a remarkable score of 665.5 in three events. Smart Luck is a 6 year old stallion owned by Cable Creek Ranch. Taking home a check for $30,800 they will also have their names added to the CD Survivor Memorial Trophy. Morgan Cromer and Faye Reys Sis made it into the Open Derby Finals. It was a very large show and we are extremely proud of their success! Wranglin Reminicky finished in the Top 5 in the Open 2 Rein division. Heza Shiney Kodo and Todd Bergen mark a 226 in the preliminary round to earn a spot in the Open Finals on Saturday. They topped their preliminary ride with a score of 226.5 in the Finals, finishing in the Top Ten and earning over $25,100 (combined prelims and finals). Faye Reys Sis with Morgan Cromer riding made the Semi-Finalist round and ended up in the Top 25. Both Mega Docs Hickory and Wranglin Reminicky were shown in the Open Two Rein Class and had very good (matching!) scores. RBR Lady Belle with Morgan Cromer riding, score a 226 in the NCHA Open - Six points higher than the nearest competitor! Unreal performance (posted by Nancy from the PCCHA show). Congratulations to Shady Lil Starlight who placed in the Bridle Sweepstakes Top Ten and marked the highest score in the Reining work. Jake rides Once A Von A Time to a Top Ten finish in the World's Greatest Horseman competition. The pair won the preliminaries for reining, bringing home a $1,000 check! Morgan Cromer and Faye Reys Sis were the Open Division Champions with a score of 76. Morgan and Smarty Hicat Annie were the $10,000 Novice Horse Division Champions, with a 75 point ride.